There is just something so instantly likeable about Lily Collins. I remember thinking that when I first read her cover-story in an issue of Teen Vogue and then seeing her in films and her campaigns for Lancome. Despite her celebrity heritage, Dad is Phil Collins, she seems very down-to-Earth and not too showy. She's aware of her starriness but not reliant on it. So when I heard she was releasing a book and that it was being praised for its realness and approachability, something not always a guarantee with memoirs of this nature, I was intrigued. It was naturally named Unfiltered*. No shame, no regrets, just Lily Collins. Before I get into the review, I just want to say how grateful I am that we are seeing books like this from a mainstream publishing house. I read a lot of essays and more often than not, the most candid seem to come from independent publishers. The fact Penguin have embraced this, no less from a recognisable face is only a step in the right direction, as was Mara Wilson's book they also released last year. Unfiltered is a collection of seventeen essays from Lily on topics ranging from eating disorders to abusive relationships, sharing stories and the relationships we form with family, friends and moreover ourselves. She also has a chapter on her beginnings with writing and journalism which I really enjoyed. It seems cliche to say "stars, they're just like us", especially when it is usually used in a mocking sense. Used in this context though, I mean it in the most flattering way. We need more books like this and while not all of Lily's stories were necessarily relatable or aligned with my own, there were certainly some I found myself drawing parallels with. At the same time, I think that one of the beauties of memoirs is reading stories that are different to your own as well as finding glimmers of similarity. The chapters on eating disorders and body image will be important for a lot of people in particular. Unfiltered is beautifully written, it never feels condescending and is the kind of book you can easily lose a few hours in or dip in and out of as you please. I really enjoyed it and hope this isn't the last we hear from Lily because it just left me wanting more. Unfiltered is on sale now in New Zealand for $35.00. 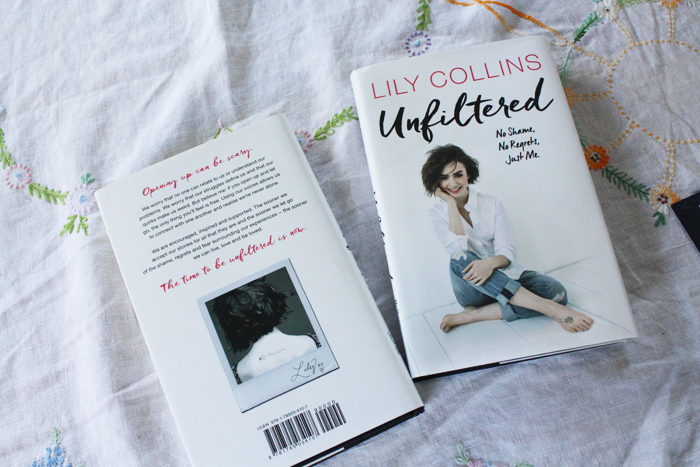 I have a copy of Unfiltered to give away to one of you lovely kiwi folk. To be in to win, just follow the steps in the Rafflecopter box below. If you are under eighteen, please get permission to enter first as I will need your address to send the book to you. This giveaway will close next Tuesday the 28th of March. Good luck! *Review copy and giveaway copy thanks to the lovely folk at Penguin Random House NZ. All opinions and love of Lily Collins and her gorgeous self+words are my own.